Studio Pepperfry - Furniture Store, Ground Floor - Nr 5 ,Titanium One Rajpath Club Road, Sarkhej, Ahmedabad. Incognito Stand-up Comedy show is a unique blend of 3 comedians with contrasting personas and an overdramatic host. Experience the hilarious comedy combined with occasional bits of dark humour with these amazing lineup of comics After 5 long days of working, forget your problems and come on Friday night at Studio Pepperfry, Ahmedabad, 8 pm onwards, to see these comics rant about their own petty problems. 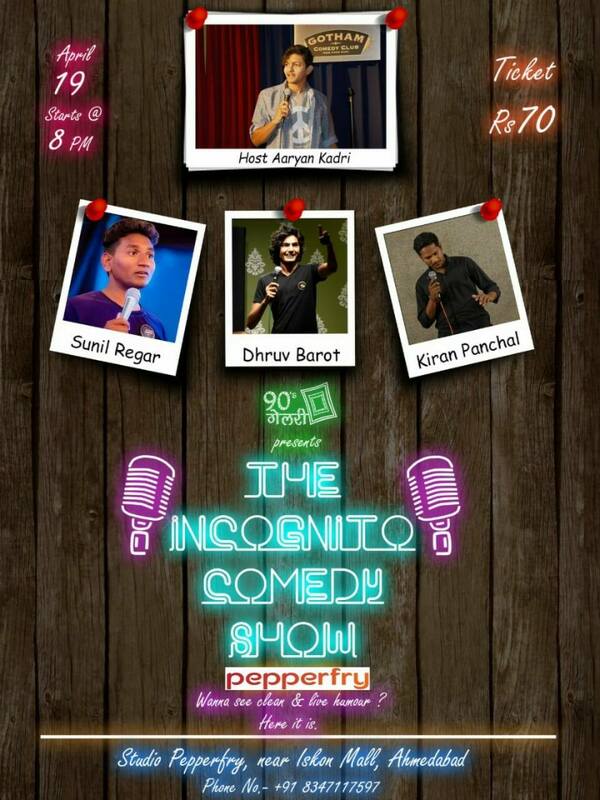 Comics: Sunil Regar, Dhruv Barot, Kiran Panchal Host: Aaryan Kadri Book a seat here, and pay at the venue.